Toms River Door & Window installs durable exterior doors that will fortify your home’s entryways and protect against inclement weather. As a specialty home remodeler located in Toms River, New Jersey, we are uniquely positioned to serve Jersey Shore homeowners who want doors that will provide lasting performance and add value to their coastal homes. Since we first opened in 1971, we have grown into a seasoned remodeler capable of solving nearly any home improvement problem while continuing to operate under the same family-run values we built our brand on. 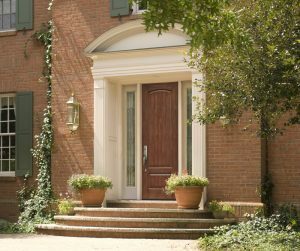 As the gateway to your home, your front door needs to be both functional and beautiful. The entry doors we install offer valuable benefits including optimal energy efficiency – proven by an ENERGY STAR rating – and the durability to withstand heavy wind and rain. Available in fiberglass and steel variations with countless customizable options, you’re sure to find a look you’ll love coming home to. Our sleek patio doors allow you to move between your home and patio with ease. We have classic hinged, space-saving sliding, and luxurious French patio doors, all of which can be further customized to fit your aesthetic tastes exactly. With more glass and less frame, your new patio doors will provide clear, unobstructed views as far as the eye can see. Severe coastal weather can take a toll on exterior doors, which is why we offer resilient storm doors for added protection. Whether your home is right on the beach and you’re hoping to keep salt, sand, and sun off of your front door, or you’re located inland and want to leave your door open for fresh air without sacrificing security, a storm door is just what you need. The installation team at Toms River Door & Window is entirely in-house, ensuring every technician who works on your home is highly trained and meets our strict standards for craftsmanship. These individuals are not only experts in their craft, but they are also courteous, attentive, and dedicated to doing everything necessary to ensure your complete satisfaction. As a family-run company, we are truly invested in and care about those we serve, which is why the service we provide will be second to none. To learn more about the various exterior doors we offer, contact Toms River Door & Window to schedule a free, no-pressure consultation. Or, stop by our showroom, conveniently located right off of the Garden State Parkway.